Networking From The Trenches | Ramblings about my thoughts, experiences, and ideas. Configurations that are only rarely completed can cause the most headache and frustration even if they are fairly simple. 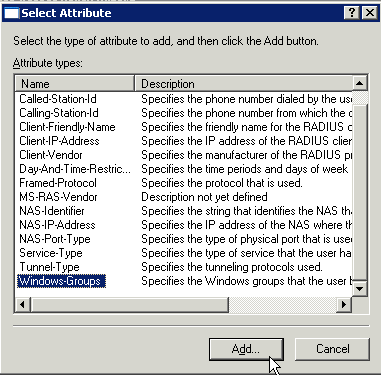 The setup of a new AAA Radius authentication to Microsoft IAS for administering network gear is something that always seems to take longer than expected because of the little intricacies involved in getting the different pieces to talk together. Here I will walk through the bare bones basics of getting the AAA authentication to my network gear working. 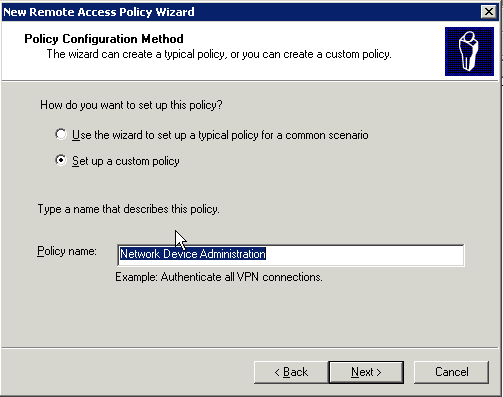 The Wizard will start, at the “Policy Configuration Method” screen, choose “Set up a custom policy” and give the policy a descriptive name. Next is the “Policy Conditions” screen. Here is where you can provide the checks that will be done to all incoming requests to see if this policy applies. To start with add a “Windows-Groups” check. Other checks can be included later to further narrow-down the application of the policy. Choose the Active Directory group that the authorized network administrators are members of. On the “Permissions” page, choose to grant permission. Cisco switches and routers use PAP as the authentication method for local processing. By default the new remote access policy prohibits the use of unencrypted authentication methods. To change this setting, edit the policy you just selected and click “Edit Profile”. 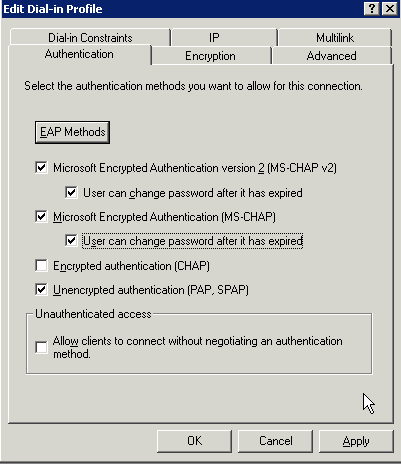 On the Authentication Tab, check the box next to “Unencrypted authentication (PAP, SPAP)”, and click OK. 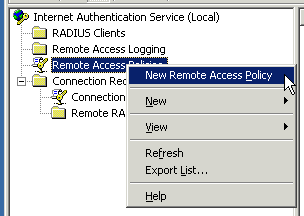 Right click on RADIUS Clients, and choose add new client. Enter a friendly name for the network device and the host name or ip address. On the Additional Information screen, check the drop-down list for Client-Vendor and locate the matching choice. 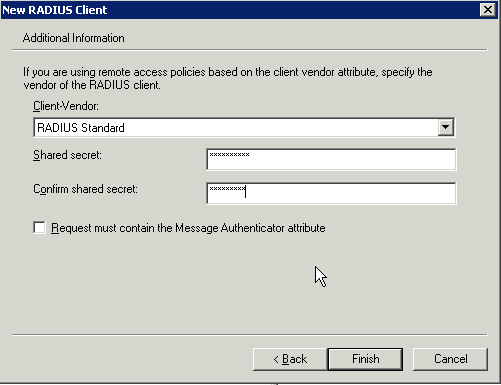 The default of “RADIUS Standard” should work for most equipment, Cisco included, but some vendors provide extra details in requests that can be useful. Also enter the Shared Secret that will be used for communications between the network device and the server. Note: The shared secret is used to encrypt passwords in communications between the network device and the Radius server, not the whole packet. Note: The below configuration was taken from a Catalyst 3560 running IOS 12.2. Other IOS devices will use similar format, but there maybe minor differences in syntax. 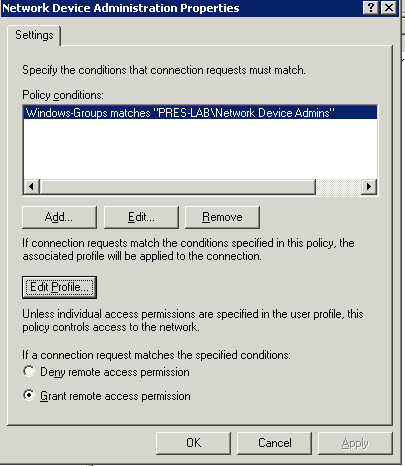 Add the Network Administrator into the Security Group configured during the “Remote Access Policy” configuration in IAS. 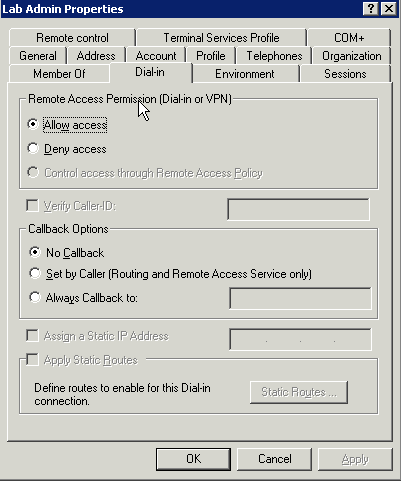 Check the “Allow Access” box on the “Dial-in” tab of the user properties. Note: This is a requirement left over from the lineage of IAS and Routing and Remote Access configuration. Having this box checked is a global requirement for any user being authenticated by IAS. 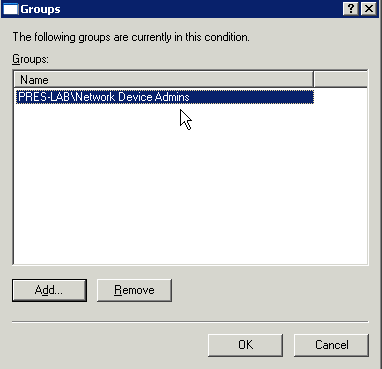 Refer to the logs on the switch/router as well as the System Event log on the Windows Server. System Errors such as the below don’t necessarily mean the username/password combination was incorrect. Because the password is hashed using the shared-secret, a typo there can result in an apparent incorrect password. Double and triple check the shared secrets match. User labadmin was denied access. Reason = Authentication was not successful because an unknown user name or incorrect password was used. I’ve decided to start off the new year by wiping the slate clean on my lab configuration and putting together a new configuration that will allow me to work on and test out some of the technologies that are relevant to me currently. I’ve had many lab configurations over the years, and most of them have been pretty small and focused on working out a particular problem, or for prepping for the exam of the month. 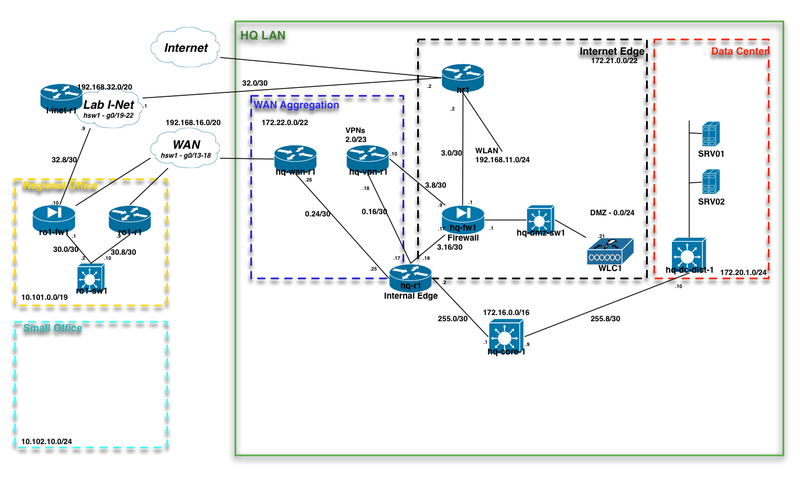 This iteration of my lab will be a little different, in that I am aiming to mock-up, as close as I can with the resources at hand, an enterprise network complete with the traditional network layers, a data center, a dmz, WAN connections to remote offices, DMVPN over the Internet, remote access VPN, etc. The end-goal is quite large, and it will take some time to completely get it up and running, but it will provide me a testbed for working with many aspects of enterprise networking. As I work through the setup, I’ll be posting entries on progress, and specific configurations and tests I’ve completed. Please leave any comments or suggestions for things to try or test out. Here is a short sampling of things I’m looking forward to setting up in the lab. Here is the network diagram I put together for what I’m looking to create in the lab. It isn’t complete, or fully detailed, but it does provide a good representation of what I’m working on. I’ll also be using it as a working draft and will update it as the lab comes together. I was sent out to help a new client with a wireless networking problem that had been progressively getting worse, and which their efforts to resolve where failing short. The problem network was covering a large warehouse in which Symbol scanners were used by the employees to process their product and shipments. This company had recently been purchased/merged with another company, and as part of the merger, the wireless network was completely changed over from about 12 Cisco Autonomous Access Points to a similar number of Cisco APs connected to a Wireless LAN Controller. Shortly after making the change in gear, the workers began experiencing a much higher number of scanner disconnects and delays. The internal networking team attacked the problem in a typical way by doubling the number of access points, and raising the power level of all APs to maximum. After making these changes, the problems didn’t improve, and may have actually gotten worse. They then reached out for some external assistance. My first visit to the site was a quick one to gather some information and do a quick walk through of the space to familiarize myself with the network. Upon deeper inspection, I began to notice that the access points reported significant channel interference measurements, and that the suggested power levels were much lower than the hard set maximum configured. I scheduled another site visit to perform some more in-depth RF analysis of the areas. What I found during the next visit was in any one area in the warehouse, my scanner picked up very solid signal strength from anywhere between 4 and 8 access points. Being that this network was supporting older 802.11b scanners, this meant that there was significant co-channel interference almost everywhere, as well as the potential for client confusion with so many “good” choices for access points to connect to. With this information, I suggested re-enabling the automatic power level control (RRM and TPC) available on Cisco’s Wireless LAN Controller. Shortly after making this change, as well as some other best practice adjustments, wireless scans in the area looked much better, and instances of client disconnects dropped to nearly none. This is a great example of how in wireless networking, more and stronger can actually have a significant negative impact on network performance. Though intuitively adding access points and raising the power levels would seem to be a good idea, either of these choice can actually cause significant adverse affects to the network. Key to a healthy wireless network is a good site survey and RF analysis. Today, this is most easily accomplished by using the intelligence built into the wireless control systems. Both Cisco’s RRM and Aruba’s ARM features can make both channel and power level assignments and adjustments very simple. After spending the last several years reading the blogs of other professionals in the networking field, I decided it was time to jump in and start contributing to the community myself. Networking and Information Technology in general are big fields, with many professionals working everyday, but we all have those times when you can feel all alone out there. I’ve had that feeling many times over the years when confronted with a particularly difficult or unique challenge. In those times I’ve turned to Uncle Google for advice. More times than not, he has pointed me to a blog, web site, or posting from someone else who has run into the same walls and found the way around it. I will be posting my own experiences and thoughts here, with the hope that I’ll be able to open a door for fellow networkers out there as they run into walls of their own. With that, grab your console cables and let’s see what we can do from the trenches!